The Virginia-Highland Civic Association’s annual general meeting and election of officers will be held Thursday September 18th in the Inman Middle School cafeteria, starting at 6:30 PM. Please be sure to bring your ID or recent utility bill in your name as proof of residency. Regular civic association business will be conducted at the VHCA’s monthly board and general meeting to be held September 8 at 6:30 PM at the public library on Ponce de Leon Ave.
Our neighborhood thrives because of a high level of volunteer involvement by residents in a variety of areas. The framework for much of this volunteerism is provided through VHCA’s committees: Budget, Fundraising (Summerfest, Tour of Homes), Planning, Preservation and History, Parks, Safety, Education and Communications. Click here for a complete list of the association’s committees, their areas of responsibility and their current chairs/members. Click here for a list of those serving on the current VHCA board. Any of these board members would be glad to talk with you about the responsibilities and time commitments associated with board service and will be glad to answer any questions you may have. Many citizens reach the board after serving on a committee, but this is not a specific requirement for running. If you’d like to run for a seat on the board, please send an email to communications@vahi.org with your name, contact info, a short bio, and a few comments on how and why you’d like to get involved. A list of all residents running for the board with bios will be published on vahi.org and included in The Voice e-newsletter prior to the September 18 annual meeting. We encourage all VaHi residents to attend the annual meeting and make your voice heard. Again, please be sure to bring your ID or recent utility bill in your name as proof of residency. The more residents we have at the meeting, the more the VHCA’s 2014-15 leadership will reflect the collective thoughts and goals of our community. 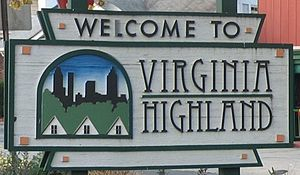 The nominating committee of the Virginia-Highland Civic Association presents the following list of candidates, all of whom have declared their candidacy. Click on the candidate’s name to go to a page with candidate bio’s. Members of the association (18 years of age residing within the official boundaries of Virginia-Highland) may vote at the Annual General Meeting to be held September 19, 2013 at the Inman Middle School Cafeteria starting at 6:30 PM. In order to vote, please bring a copy of a valid ID (GA driver’s license, e.g.) or a utility bill issued within 60 days of the meeting and showing your name and address. Members may also vote by absentee ballot. Your ballot along with a copy of one of the forms of identification mentioned above may be delivered to the offices of Tailfin Marketing (1246 Virginia Ave.) by noon on Thursday, September 19th or to the Annual Meeting by its start time at 6:30 PM. Please put your ballot in a sealed envelope with the identification documents separately sealed inside or stapled to the outside. (Please cross out specific account or driver license numbers.) After your residency is verified, the identification documents will be removed and destroyed. Your ballot will remain anonymous. Click here for a copy of the absentee ballot.